SUU Aviation is opening its hangar Wednesday to the public at 7 p.m. for music, a meet-and-greet with pilots, free snow cones and the best view of the fireworks show. All are invited to bring their own picnic and lawn chairs and enjoy a live music performance by 3hattrio starting at 7:45 p.m. and going until dusk when the fireworks show begins. The group 3hattrio is made up of local talent Hal Cannon, Eli Wrankle and Greg Istock, who aim to create music that acknowledges the culture and people who work and live in the deserts of the American Southwest. The group has toured in many locations, including Scandinavia. During the event, SUU Aviation pilots will be available for a meet-and-greet and will show various aircraft on the tarmac, offering community members the chance to interact with SUU’s pilots, ask questions and tour its state-of-the-art helicopters and planes. The SUU Professional Pilot Aviation Program prepares students for a career piloting aircraft in many aviation industries around the world. SUU Aviation offers training in rotor wing pilot or fixed wing pilot. For more information about the program, call 435-865-8600. What: T-Bird Hangar Party and Fireworks Show. 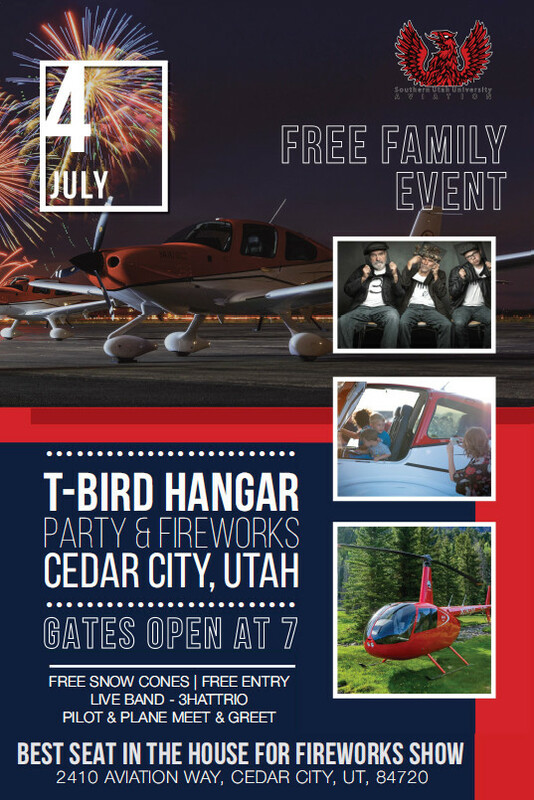 When: Wednesday, July 4, at 7 p.m.
Where: SUU Aviation hangar, 2410 Aviation Way, Cedar City. Admission: Free and open to the public.